Back in June I reviewed issue 1 of ‘Chapter 2’ / reboot of Resurrection. To be honest I was not that impressed with it – I thought Greenwoods art lacked something, that it was too ‘cartoony’ for the subject matter, and the characters left me unmoved. Overall I felt uninvolved. One highlight was the start of the issue, featuring Bill Clinton, as the President of The United States, addressing his nation about the Alien invasion. I nearly gave up after issues 2 & 3 to be honest. But this issue just about has the start of something interesting. 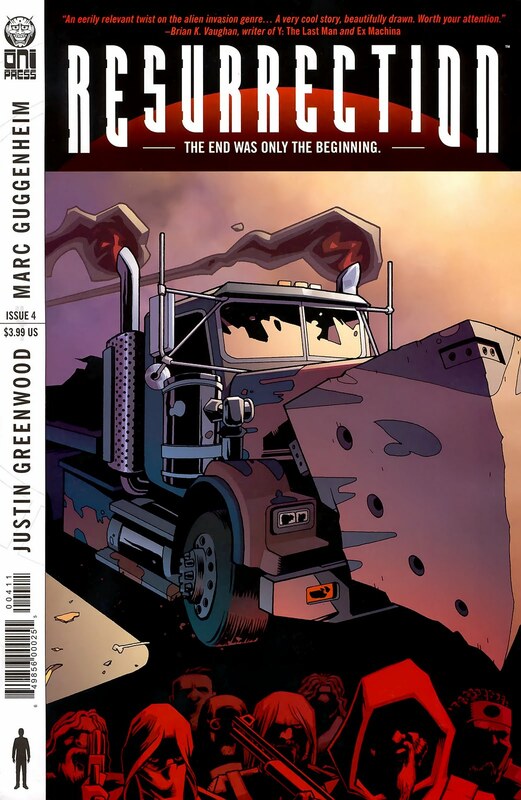 Without giving away the ending, it is fair to say that what Guggenheim began with at the start of ‘chapter 2’, he carries over into the end of issue with some style. Oh, and there is some ‘Dawn of the Dead’ type shenanigans with the Road Agents trying to break through into Red Lion. Being British, everytime I read ‘Red Lion’ I think of an old-school English pub, with nictine stained walls and a fruit machine blinking in the corner of a dimly light room. So let’s forget the fact that ‘Red Lion’ is a plain daft name for a sanctuary, and grab what positives we can from this – Resurrection #4 turns a corner – it actually works on a basic level (to entertain), though a lot of the problems I have with the series – the art, the lack of character in the characters – remain.